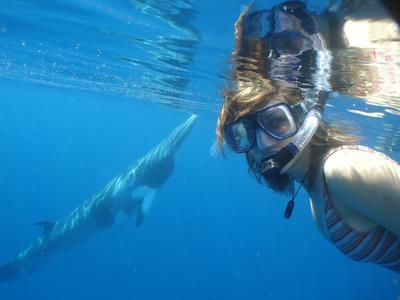 Swimming with minke whales on the Great Barrier Reef has just been voted one of the most “Incredible Travel Secrets in Australia” taking out first place in Queensland and third in the nation, as well as "Australia's Most Profound Wildlife Secret" by Australian Traveller Magazine. This extraordinary event happens in only one place in the world - here in our own backyard. So maybe it’s time we found out what all the fuss is about. 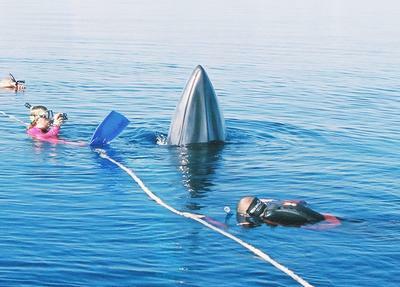 Dwarf minke whales visit the northern GBR during the winter months. It is believed they come to our warm, tropical waters to mate and give birth and throughout this time they show an insatiable curiosity in people and boats. Human interactions with these whales can involve from 1 to 30 animals and can last for hours on end. In fact, the longest encounter on record lasted for over 10.5 hours (you can see an expose of this expedition here: https://www.youtube.com/watch?v=Ahlj8cPX-J4). John Rumney of Eye to Eye Marine Encounters and formerly of Undersea Explorer helped pioneer the swim with minke whale industry in Australia and together with scientists from James Cook University and the Museum of Tropical Queensland developed a Code of Practice for sustainable whale encounters. Fast-forward almost 17 years and these guidelines are now considered “World’s Best Practice” by the International Whaling Commission and have won numerous awards for sustainable and ethical wildlife interactions. •	Keep a flexible itinerary to ensure the best minke encounters at the most favourable locations, based on the weather. •	Maximum time spent with the whales (trips often include a flight in/out of Lizard Island to reduce travel time and increase time spent in the peak sighting areas). •	Provide an educational twist by donating free space to whale researchers. This unique arrangement provides an enjoyable learning experience for passengers (who are encouraged to assist through photo and video identification) while allowing scientists much-needed access to the field. It is a win-win for everybody involved. 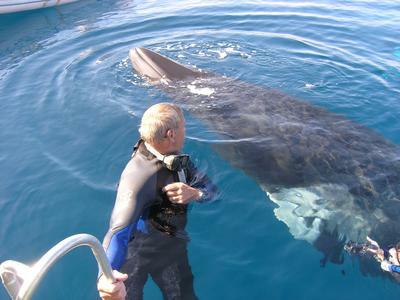 When not interacting with whales, Eye to Eye Marine Encounters expeditions involve diving/snorkeling at some of the best dive sites on the GBR (e.g Cod Hole, Pixie Gardens, Challenger Bay). This season, trips will be on board the iconic adventure diving vessel Undersea Explorer and will have two charismatic scientists on board, Dr Alastair Birtles (head of the Minke Whale Project) and adventurer/cinematographer Dr Dean Miller. To find out about how YOU can come eye to eye with the world’s friendliest whale or just to learn more about these extraordinary animals please check out the following sites. Click here to return to GBR.